We were first to come up with LBT, a very finely shredded thin mylar. Incredible for dubbing, wings, collars and shucks. The most universal way we use the material is to center tie a bundle and fold it back over on itself and take a couple more wraps. 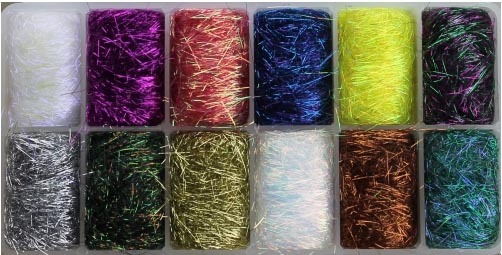 Try mixing up your favorite blend and dubbing it over a wool under body for a incredible minnow. 12 colors of our most popular Lite- BriteTM loaded in our Traveller’sTM Dispenser for the most eye-catching dispenser display. Pearl Blue, Burgundy, Salmon Pink, Ocean Blue, Brite Yellow,Rainbow, Silver, Firefox Peacock, Gold, Polar Pearl, Copper, River Green.